The Great American Melodrama definitely has a thing for puns, but Under the Boardwalk might be as punny as it gets on that little stage in Oceano. 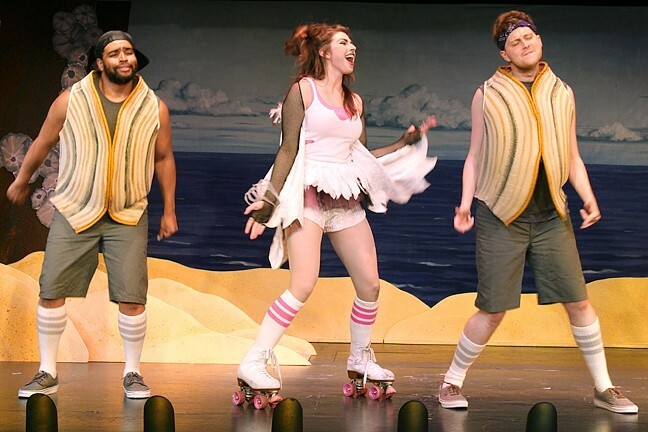 Rapping clams, roller-skating gulls, and a DJing starfish get a little dirty under the pier in this kooky Westside Story meets Pismo Beach tale about a love affair between a clam named Glen (Philip Bolton) and a seagull named Daria (Chelcie Abercrombie). The play, directed by Dan Schultz and written by Erik Stein, is back on stage by “popular demand,” and it will show through Sept. 25. It all starts and finishes underneath the Pismo Beach pier, where barnacles grow and shellfish fight birds for control over a little slice of sandy heaven separated from the humans and safe from the tide’s ebbs and flows. CLAMTASTIC: From left, Glen (Philip Bolton), Rita (Emily Chatterson), and Bivalve DeVoe (Toby Trooper) belt out a special version of Micheal Jackson’s “Man in the Mirror”—hint: replace man with clam—in The Great American Melodrama’s Under the Boardwalk. MC Clammer (Philip David Black) might be my favorite character, with his “hammer-time” glasses, his seriously sour face, and the way he buries his head between his shells when he gets upset. But Toby Tropper stole the show as clam Bivalve DeVoe with rip-roaring comedic timing and a frustrated poor-me attitude. Classic songs such as Michael Jackson’s “Man in the Mirror” and Queen’s “Somebody to Love” were rewritten by Stein and Jordan Richardson to fit the clammy theme. Think “Clam in the Mirror” if you want to get an idea for the pun-laden music that serenaded an audience that couldn’t help but laugh out loud at the ridiculousness of it all. And it was ridiculously silly and a little cheesy, but it was also engaging and fun to watch a clam and a seagull try to find their way to one another in between the warring factions of their respective species. It’s just unnatural for a gull to kiss a clam, squawked Rita (Emily Chatterson), once Daria revealed the faux pas she committed after saving Glen from an untimely death by undertow. Unless, of course, you were just getting a little taste, Rita crooned, because clams are delicious. Since the beginning of time the gulls have ruled the beach, and the clams were just there for feasting—so why change that now? Daria, like any being in love, doesn’t know why, she just knows she’s got feelings for that particular clam. This doesn’t sit too well with her feathered roller-skating (those ladies performed the whole thing on skates!) sisters, who chided and ousted her for what she did. Meanwhile, back under the pier, Glen doesn’t say a word to his clammy pals, who are gearing up for the next round in the sandy revolution to take over that shaded stretch of beach. GET CLAMMERED: Take your love of puns with you to The Great American Melodrama’s 'Under the Boardwalk,' a love story about a clam and a seagull, showing through Sept. 25. For more information, check out americanmelodrama.com or call 489-2499. Daria overhears his silence, and mayhem ensues—including a poop bombing, which might be the best scene in the whole play. Following Under the Boardwalk was a quick set change for the “I Love the ’90s” vaudeville revue. And as someone who spent her teen years in the ’90s, I thought it was pretty great. Aladdin, Shania Twain, and Wayne’s World got shout outs next to Britney Spears, Garth Brooks, and Clueless. And yes, those effortless puns continued! Editor Camillia Lanham is a pun master at clanham@newtimesslo.com.